In recent months, we’ve learned a bit about edible wild plants and how to use more fruit species in our landscaping. These micro-local approaches to our food production are going to be an important part of how we reshape our consumption patterns in the coming years, and will have a large impact on the environment and economy if they are widely adopted. Having addressed plants, then—and leaving livestock out of the picture for now—there’s one other kingdom we should think about when we consider how much more good food we can easily grow or forage for ourselves: fungi. Mushrooms are ubiquitous. Fungi do much of the heavy lifting when it comes to breaking down dead things and returning their nutrients to the soil so other things can grow; it’s not a stretch to say that we owe them our lives. We buy a lot of them, but mostly just one kind; US consumption is estimated to be nearly one billion pounds in 2009, but of that the vast majority will be of agaricus bisporus—button, crimini, and portobello mushrooms are all essentially the same thing. Tastier (and pricier) varieties are available—fresh and dried—in supermarkets, and gourmet stores offer such delicacies as morels, chanterelles, and porcini. But these varieties can easily reach $30 per pound, putting them out of reach for regular eating. And truffles are one of the world’s most expensive foods, leaving most of us to make do with infused oils in place of the real thing. Mushrooms offer excellent ways to add umami—the fifth flavor, a meaty, savory richness—to our cooking, especially if we don’t eat meat. 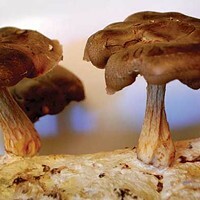 Asian traditions have used mushrooms medicinally for millennia, and modern research is confirming strong anti-cancer and other beneficial properties in many species. 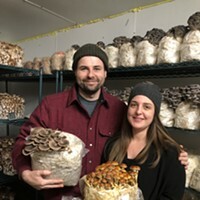 Many of the most expensive and desirable varieties grow in the woods all around us, there for the picking, and yet almost nobody these days avails themselves of the free food in the forest; most of us fear wild mushrooms to the point where we think it’s not even safe to touch them (it is). This is not to say that there aren’t risks; there are. Some kinds can make you sick, and a few are fatal. What we call “mushrooms” are the spore-producing fruiting bodies of much larger organisms that live underground and/or in rotting wood. The unseen network of fibers that makes up the main portion of the fungus is called the mycelium, and it is the mycelium that we cultivate in order to harvest the fruit. We do this by giving it what it likes to eat, which is usually wood in whole, chipped, or powdered form. Since many of us already use mulch and logs in and around our gardens, Janjigian suggests that we begin there. By inoculating the mulch and edging with desirable mycelium, we can produce luxury food in areas that are currently unproductive. Janjigian’s favorite fungi are oyster mushrooms and winecaps. “Oysters will grow in just about anything, so they’re the best way to start.” Bags of inoculated sawdust are available online (see sources, below) and can be sprouted as they are or broken up to inoculate wood chips, newspaper, grain, or even telephone books. Indoors or out, keeping them damp is really the only requirement. As they use up nutrients and stop fruiting, the trick is then to harvest some healthy mycelium from the substrate and use it to inoculate a fresh batch. That’s really all there is to it; they can fruit in as little as two weeks—an eyeblink in gardening time. Winecaps (which aren’t for sale in stores but make for choice eating) like both soil and hardwood chips, so they spread freely in and out of the garden, requiring little care since they will move to new areas in search of more food. It’s an appealing notion to convert mulched garden paths into productive space, and since mushrooms fruit so quickly there’s no need to tiptoe around them while they grow: Just cut, eat, and repeat.